Located on the slope of Terrace Mountain near the northern boundary of Yellowstone National Park, Mammoth Hot Springs shows unique characteristics compared to southern geyser basins. Not only the lack of geysers due to lower water temperatures make the difference, but in particular also the distinctive travertine deposits of the hot springs. They have reached an overall thickness of roughly 75 m (246 feet) and an expansion of more than 4 km2 (1.5 mi2) since the first springs started flowing nearly 8000 years ago. Travertine is a special form of limestone, consisting of the two minerals aragonite and calcite, chemically both calcium carbonates. In contrast, the majority of Yellowstone's hot springs precipitate siliceous sinter, and this at a much lower rate. On visits in Mammoth Hot Springs the very different appearance of travertine terracettes and stalactites from siliceous sinter formations become obvious already from afar. The photo above shows the lower terrace area from the east, with Main Terrace on the entire left hand side, seamlessly follwed to the right hand side by Marble Terrace, Pulpit Terrace, Jupiter Terrace and Mound Terrace. Halfway up the slope between Marble Terrace and Jupiter Terrace the famous, pulpit-like terracettes of Pulpit Terrace, wherefrom reportedly preacher men proclaimed the Gospel, once were resting on beautifully sculptured stalactite pedestals and displaying high discharge between the 1870s and 1888. Apparently, some of them have then been swallowed by the eastwards growing terrace, while the remainder has eroded almost beyond recognition after the spring ceased flowing in 1926. Change at Mammoth Hot Springs from year to year, from month to month, and sometimes from week to week may be dramatically. Because of a travertine precipitation rate of up to 5 mm (0.25 in) per day, or 1.8 m (6 feet) per year at an average around 30 cm (1 foot) per year, springs, pools, terracettes, and terraces may look very differently even after a short time span. Therefore, it is sometimes quite challenging to assign a pool or terracettes to a named spring until you do know the location of the vent. And even vents may shift, or run temporarily dry, or emerge for the very first time at an unexpected position. Occasionally, one name stands for more than one vent that feed one source pool or even separate source pools, not to mention the subsequent collecting pools formed by lower terracettes. All the place names at Mammoth Hot Springs have been historically established over a time period of nearly 150 years, always depending on the sequence of activity. Taking into account the quick alterations of the limestone structures and vent locations it is not surprising that identifications often turn out to be tricky. 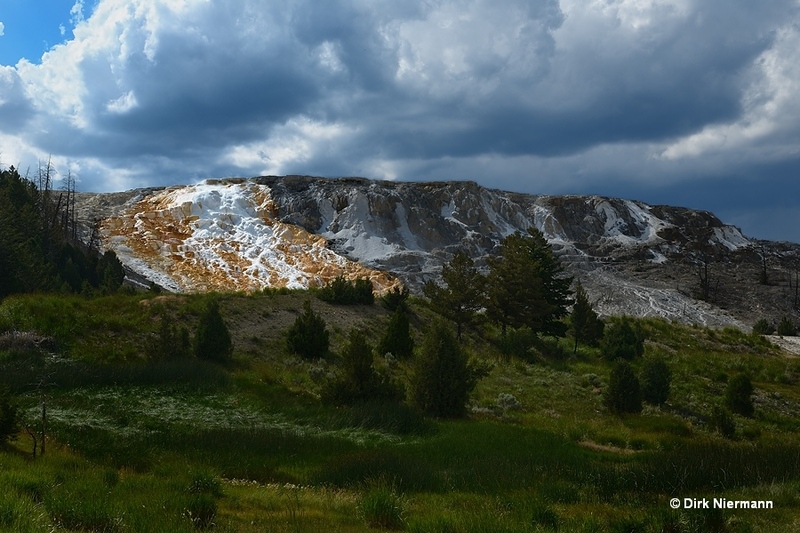 Many visitors have the feeling that Mammoth Hot Springs is drying up due to dry springs they remember having seen flowing water years ago, or due to the extended gray, inactive terraces, some of which are already showing signs of decomposition. But this impression is deceiving. Different monitoring projects, done in the 1930s, the 1990s, and in the 2000s, revealed that the water discharge of the Mammoth Hot Springs system, also comprising the Boiling River, has been approximately constant over all the time. Based on this it can be suggested that also in the past hot water never overflowed all terraces or even just the majority of them simultaneously.